"F-22 RAPTOR CAN STILL SHOOT HOMOSEXUAL AGENDA DOWN IN FLAMES"
Since my divided government obsession had me registering, supporting and contributing Democratic for the 2006 election, then registering, supporting and contributing Republican in the 2008 election, I am bombarded by political e-mail solicitations from across the political spectrum. Most of the e-mail is moved unread straight to the trash bin. Every once in a while, a subject header will get my attention. Like the one that pulled up the screenshot e-mail pictured here. Yes. It really says that. 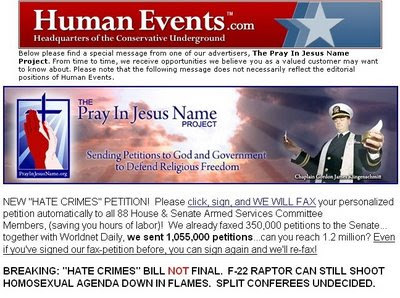 I am not going to link to the "Pray in Jesus Name Project" (PIJNP) that paid Human Events to have their message delivered into my e-mail inbox. However, the subject line did its job, and I did feel compelled to read it - just to understand what kind of madness could possibly flesh out that headline. I thought at first it must be a parody. Alas - no. First, some background. An amendment to strip funding for production of the F-22 Raptor was approved in the Senate and excised from Defense Authorization bill under threat of veto by Obama. The F-22 is an expensive fighter without a mission in today's world. It does not fly in either Iraq or Afghanistan. The Air Force does not want or need more F-22's. Defense Secretaries and Joint Chiefs under both Democratic Republican and Democratic presidents have tried to kill further production. Both Clinton and Bush tried and failed to kill it. Obama finally did. Just barely. I read the PIJNP e-mail, so you don't have to. As near as I can tell, the idea is to get F-22 Raptor funding reinstated in the defense bill while it is in conference, for the express purpose of triggering an Obama veto, so that the Leahy Hate Crime amendment attached to the Defense Authorization Bill would also fail as collateral damage. Or something like that. Perhaps they have a chance. This group, and this e-mail appeal may not be worth the attention I'm giving it. but, they seem to have money for heavy internet advertising, claim to have driven 350,000 petition signatures, and some people are paying attention, so... its worth a look. What are we to make of what is being advocated in this e-mail appeal? Some possibilities. If we take this at face value, we have social conservative religious zealots that actually believe that the "Homosexual Agenda" is a threat so dire, that it is worth risking: a veto of the defense budget; diverting defense resources needed for the wars we are actually fighting; and completely wasting $1.75 billion of taxpayer funds on an unneeded weapons program. All to stop the homosexual agenda and sacrificing both conservative fiscal and security principles. Lockheed Martin has been pretty darn effective in gaming the procurement process to continue this particular weapons program. Lockheed arranged for Raptor components to be built in 44 states. As a consequence, 40 Senators voted to continue the program, including liberals like Barbara Boxer, Diane Feinstein and Chris Dodd. A majority of the Nancy Pelosi Democratic House of Representatives voted to continue the program. Could Lockheed, a member in good standing of what John McCain calls the "military industrial congressional complex" be taking the "game" to another level by using this organization as a front group? Recall that many believe the 2004 homophobic campaign against gay marriage generated enough additional Republican voter turnout in Ohio to swing the electoral votes for that state and lost the election for Kerry. Is it possible that Lockheed would front a homophobic social conservative organization simply to drive faux grass roots support for a unneeded weapons system? Seems unlikely... but who knows? Regardless, this points to the continuing conservative conundrum faced by limited government advocates and deficit/spending hawks. The only electoral mechanism that can have an actual effect on practical policy in the short term, is for libertarians, fiscal conservatives and limited government advocates to support Republican legislators in 2010 and 2012 to divide this government. The fusionist alliance between fiscal and social conservatives (GOP factions described by Ryan Sager as" libertarians" and "evangelists" in his excellent book "The Elephant in the Room"), has been the path to electoral success for Republicans in recent decades. Others describe the alliance as three legs of a tripod supporting the GOP platform - fiscal conservatives , social conservatives and security conservatives. But how can fiscal conservatives and libertarians make common cause with social conservatives if they are actively working to undercut the two other legs (fiscal and security conservatives)? I don't know how representative the "Pray in Jesus Name" project is of the social conservative rank and file. I pray in Jesus name that they are not the norm. But whether they are religious zealots, a front for cynical corporate manipulation, or straight con-men, having fellow travelers like the "Pray in Jesus Name Project" doesn't make it easy to cast a vote for divided government and fiscal responsibility in 2010. But, as Samuel Johnson noted, "The prospect of being hanged focuses the mind wonderfully". As does the absence of any other options to constrain spending by this administration. if there is only one path to get to your destination, it is a good idea to take the path. Technorati tags: libertarian , F22 Raptor, Divided Government, Conservatives, Republicans, 2010 election.